Choice of framing material. Window frames conduct heat. The U-factor measures the rate of heat loss of a unit. Those with a lower U-factor reflect solar heat better. If you have windows like these, your home maintains a consistent temperature throughout the day. Glass coating. Glass is a major window component because it allows natural light to pass through. With constant exposure to sunlight, the glass is covered with special low-E coating that controls heat transfer. Window placement. Where you put your windows is important in improving energy efficiency in your home. When a Chesterfield, Missouri, windows company like Renewal by Andersen® of St. Louis installs south-facing windows, these can collect more heat during winter. North-facing windows allow for more daylight. Knowing where to place your windows can be very helpful in reducing your use of your heating or cooling systems. Type of window. Different window styles have lower air leakage rates. For example, casement windows don’t leak air as much as other types because the sashes are pressed against the frame when closed. By installing fixed windows facing north, you get more outdoor views without compromising energy efficiency. Installation. For a window to be energy-efficient, it should be installed following specific manufacturer instructions to the letter. After the units are put in, our experts will make sure that your replacement windows are tightly sealed to avoid air leaks. With the right combination of the factors above, your replacement windows can help you save money on monthly utility bills. Make a wise investment and have energy-efficient windows installed today. 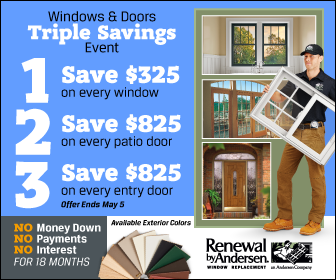 Renewal by Andersen® of St. Louis is the leading windows contractor in Chesterfield, MO. Our windows are made with Fibrex® frames, which can insulate about 700 times better than aluminum. Combined with High-Performance™ Low-E4® glass, you will get maximum energy efficiency as well as improved comfort for your home. Further, our team of knowledgeable designers can help you choose which window style is ideal for your home. We offer a wide range of styles and colors that will complement a traditional or modern home. With our systematic installation process, you can be assured of a beautiful window that fits your openings precisely— and without any gaps. Give us a call today at (314) 332-2364 to schedule a free in-home inspection. If you want to see some of our window options, you can browse our gallery here.